Some people — okay, me — are of the mindset that brown booze is a year-round sort of thing, the kind of drink you keep in your glass on winter’s darkest evenings as well as summer’s brightest afternoons. But there are also people — okay, me again — who think that whiskey and other aged spirits are particularly well-suited for the cooler months, and make these spirits a staple of their October-through-April sipping, if for no other reason than to leave a few months open so all those gins, light rums and blanco tequilas in the liquor cabinet don’t start feeling neglected. It’s been sunny and in the 60’s in Seattle, and this past winter was quite gentle in these parts, though snow and ice and traffic-snarling storms seem to have continued right up to Easter in other parts of the country. But with the season finally starting to shift, I thought I’d perform my semi-annual dusting off of the blog in order to tip my proverbial hat to some of my most reliable whiskies from this past season. Note I didn’t write “essential whiskies” or “best whiskies” or “greatest whiskies you’ll never be able to taste” or any of such tripe (those ideas I save for my paid work–?KIDDING! But not really…) — ?but rather, these are whiskies that, over the past six months or so (with several making repeat appearances from winters past), have made it into my glass with such frequency that they deserve a generous pour of credit for keeping me from absolutely losing it during another gray, damp, moss-gathering Seattle winter. I’m not listing anything exceptionally rare or expensive here — hell, some of these may come across as downright pedestrian — but especially during the winter grey, whiskey hour is regularly observed in my house, and if it was all Pappy 20 and Gordon & MacPhail selections around here, I’d be even more financially destitute than my questionable career as a booze writer already leaves me. * Pretty much anything from Four Roses?— You couldn’t buy Four Roses straight bourbon 10 years ago — not in this country, anyway. But one of the best things to happen to bourbon drinkers in the century thus far is the grand American homecoming of Four Roses. 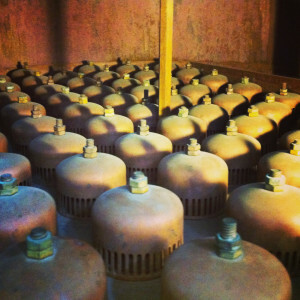 What makes Four Roses so notable? How the hell should I know; it could be the two mashbills they use (one rye heavy, and one, um, not), or their five yeast strains, or the way they take these 10 bourbon recipes and marry them (or not) to make everything from Special Edition Limited Barrels (single yeast strain, single recipe) to the Single Barrel (ditto) to the Small Batch (four of the ten recipes) to the Yellow Label (a little dab of everything). 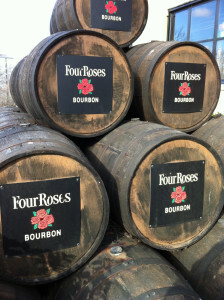 Again, how the hell should I know how they manage to pull flavor magic out of a pile of corn and rye — but whatever they’re doing, it works across their product spectrum, and the Four Roses Yellow Label is one of the few basic, entry-level (read: around $20 or less) bourbons I’ll drink all on its lonesome, though it does make a very comforting Old Fashioned. As far as the more premium bottlings — well, they’re just perfectly balanced, a nice mix of rye spice and corn sweetness with enough barrel influence to make it sugary and seductive without going over the hill into oaky astringency. * Pretty much anything from Heaven Hill?— Pretty much, that is; ignore the novelty items and the assorted vodkas, liqueurs and other spirits that help them pay the bills, and focus on the exceptional (and extensive) range of bourbons, rye whiskies and others (Mellow Corn! Bernheim Wheat Whiskey!) that Heaven Hill produces. I’ll admit to sentimentality about Heaven Hill’s whiskies: the basic Evan Williams black label was the first straight bourbon I ever purchased way back when I was … well, let’s not get into that; Elijah Craig has been my workhorse bourbon in god knows how many Old Fashioneds in recent years; and Rittenhouse Bonded Rye Whiskey is goddamn Rittenhouse Rye, world without end amen — but my fondness for their whiskies extends beyond mere sentiment. Old Fitzgerald Bottled-in-Bond has been dueling it out with Four Roses Yellow Label for ownership of my “everyday bourbon” shelf for the past few years. Wheated bourbon is one of my many weaknesses, and Old Fitzgerald has that wheated softness that I find so sultry, with a little fillip of sourdough tang to keep the whiskey from lapsing into somnolence. Last year Heaven Hill introduced Larceny Straight Bourbon — exactly the same stuff as Old Fitz, but bottled at a different age and a different proof, which gives the old whiskey a fresh appeal — and I’ve been known to nip into that these past few months for the occasional Old Fashioned or Revolver Cocktail. 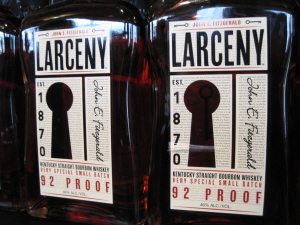 The only problem with the arrival of Larceny is now I have to keep an additional bourbon stocked in my house at all times. While both of these whiskies are still in the very modest $20-ish range, depending on where you live, Heaven Hill also delivers very well at the higher echelons of bourbon: Evan Williams Single Barrel is one of the best bargains on the bourbon shelf, a lovely sipping bourbon that flirts around the $30 mark; and to show how much they care (and what they can do), Heaven Hill has been annually releasing blockbusters under the Parker’s Heritage Collection?label. Last year’s release, the “Blend of Mashbills,” spotlighted the diverse skills of Parker and Craig Beam, but my favorite so far has been the cognac-finished bourbon from a couple of years ago. Exceptional aged bourbon with the fruity kiss of cognac? That pretty much eliminates the need for me to ever make the choice again. 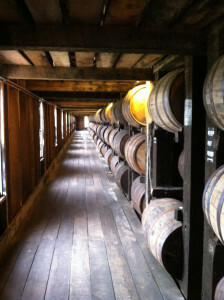 * Eagle Rare Single Barrel Bourbon?— Yes, Buffalo Trace makes a hell of a lot of good whiskey, and everything from the distillery’s eponymous bourbon to Handy and W.L. Weller makes it into my glass every winter, but Eagle Rare is the one I start to sweat about when the supply is running low. This is such a gorgeous, balanced whiskey at a cheapskate-friendly price, which is what I’m usually looking for when I’m about to make a liquor run and I’m going through my pockets looking for misplaced $20 bills. Chuck Cowdery recently pointed out that Sazerac has shifted Eagle Rare’s bottle proof in recent years; this may have happened before I started keeping it on hand (or maybe I just wasn’t paying close enough attention), but Eagle Rare still delivers a much more complex flavor and rounded character than you’re likely to find in any other bourbon at a comparable price. — coming in Part II: The whiskies from Scotland & Ireland that got me through winter…. Paul! It’s great to see you posting again; especially on a subject I keep close to my heart. I had the privilege of tasting the Aberlour a’bunadh this past winter, at an annual scotch tasting that my friend’s parents host every year. The strictly-sherry aging makes for a sweet and delicious cask strength scotch that I’m definitely hoping to throw onto my home bar shelf when I save up the cash.